I decided to go for a walk yesterday morning with my paints. A couple of hundred yards down the canal from the main basin you come to the first bridge. I was attracted to the curve in the canal bank picked up by the shapes of the bridge. The sunlight slanted through creating interesting shadows and enhancing the colour of the autumn trees overhanging the path and the scattered leaves on the ground. Yet another great study Paul. 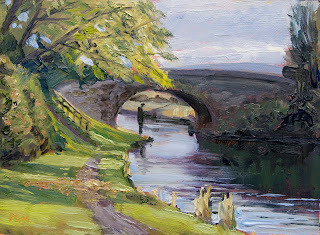 Have you ever thought of videoing your plein air painting? I'd LOVE to see how your pochade paintings come together. I've never actually considered it but I might look into it. I tend to paint on my own so the logistics might be difficult. I'm not sure what sort of painting I'd make with my attention and concentration divided between painting and filming. It may be worth setting up a little local plein air painting group if there were enough interest. There's quite an active group based around the Bristol area and quite a few people in the London area. Any thoughts on the idea? Paul. Yes, I know the people you are referring to in Bristol. They're quite prolific aren't they? When it comes to filming, I don't think they do much more than set the camera up on a tripod and then just let it run in the background, taking care not to get their head in the way. Antony Bridge sometimes makes some videos which are much more involved, but they're more like "promos" for his business. I enjoy the simple "demo" type pieces. If you were to set up a plein air group, I'd be delighted to join and help in anyway possible.